Marvin Humes has revealed JLS are hoping to rope Drake in to feature on their next single. The Beat Again singer, who is engaged to Saturdays star Rochelle Wiseman, said the boyband plan to get in touch with the Canadian rapper and arrange a collaboration. "We'd love to do a record with Drake and we're going to approach him to feature on our next single as it has to be our best yet," Marvin told The Star. "Options are not good enough - we need an out-and-out smash. We're going to Scandinavia and America over the next few weeks to put pen to paper. "Our fourth album is pivotal to our career." 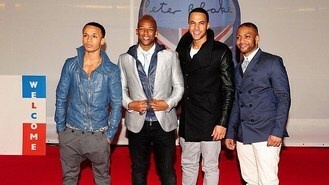 With rival boybands One Direction and The Wanted making it big overseas, JLS are also hoping to make their mark abroad. Marvin explained: "While we're very proud of what we've achieved - we've sold five million albums so far - the next album has to take us international." Cerys Matthews denies The Voice, where she appears as a mentor, is all about singing ability. Conor Maynard has revealed he is dying to have a house party to celebrate getting his own place, but he's scared of upsetting his neighbour. Adele has joined US President Barack Obama on Time magazine's list of the world's 100 most influential people. Carly Rae Jepsen has revealed how Justin Bieber helped her become an international number one star - and how he is supporting her in her music career. Jason Mraz has revealed there is a dark side to his music - but his fans may never hear it. Cheryl Cole has announced details of her comeback to the music world. One Direction have conquered charts around the world but pop queen Madonna has proved to be blissfully unaware of their existence. The Voice's Will.i.am is set for a royalties boost with one of his songs poised to score its highest ever chart placing after featuring twice on the show.